Situated on Tenerife’s southern coast, Playa de las Americas is the quintessential tourist hotspot. Glorious beaches, boisterous nightlife and hotels to cater for every type of holidaymaker but this Canary Islands favourite is much more than just a beach break destination. 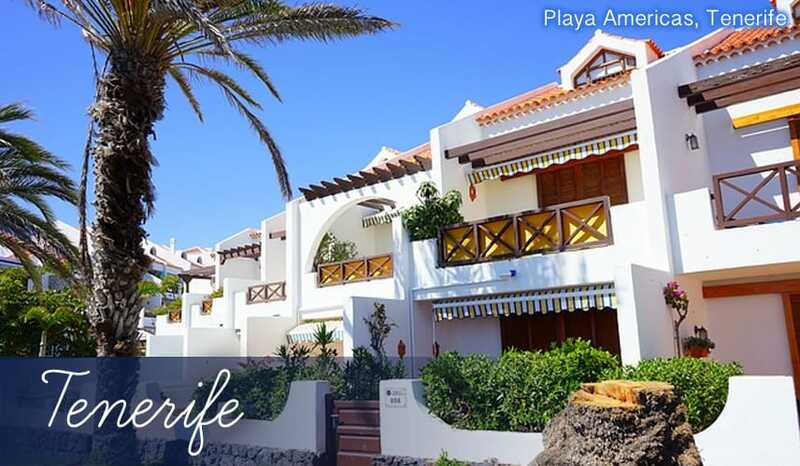 Spend a day or two away from the beach and discover what Playa de las Americas has to offer. The star attraction for a lot of holidaymakers is only a short walk from the heart of Playa de las Americas – Siam Park. Close to neighbouring resort Costa Adeje, the Siamese themed water park can provide hours of fun for kids and grown-ups alike. Do you dare take on the Tower of Power, a terrifying 30-metre drop? Race your friends on the Naga Racer slide, try out your surfing skills at Wave Palace or navigate the Mekong Rapids, try them all out. One of the most popular activities in Tenerife is a boat tour of the island. Regular excursions leave the harbour of Playa de las Americas exploring the hidden gems that Tenerife has to offer. This is the perfect opportunity to discover a side of the Canary Islands you may not have seen before. Take in the beauty of the region’s dramatic landscape and famous volcanoes in the distance. Tours tend to take up the whole day and provide a little break from the craziness of the city. If you are a keen golfer then you can test your skills on one of the best golf courses in the region. Golf Las Americas is a beautiful 18-hole course forming part of the Hotel Las Madrigueras. Whether you are a seasoned pro or just a beginner, the challenging fairways and testing greens combined with the warm weather will make for a hugely relaxing round of golf. Then, naturally, you can stop by the clubhouse for a post-game drink or two. As you may expect from a destination which has the Spanish word for beach in its name, Playa de las Americas boasts a beautiful stretch of shoreline. Unlike other parts of the Canary Islands, you will only find pristine golden sand beaches, compared to the other black sand beaches caused by the nearby volcanoes. Playa de las Americas has three main beaches – El Camison, Troya and Playa de las Vistas. Each have their own unique charms and are loved by tourists and locals alike. As Tenerife is blessed with year-round sunshine, relaxing by the beach becomes almost a mandatory activity. Hire a sunbed and soak up the rays or try your hand at watersports such as boogie boarding, kite surfing and everything in between. Playa de las Vistas is one of the largest beaches in the resort. Split between Playa de las Americas and neighbouring resort Los Cristianos, this lively stretch of the Tenerife coastline is a favourite among families. It has plenty of sunbeds, so there’s no need to wake up early to put a towel down, as well as numerous activities such as beach volleyball courts. It is flanked by a busy promenade lined with bars and restaurants, ideal for a daytime snack. Further up the coast is Troya, a much smaller affair but is a great option is you want to take a dip in the ocean. While it can get a little busy at times, there is plenty of space for you to enjoy a relaxing day at the beach. El Camison is another big favourite thanks its excellent location. The beach is situated in the heart of Playa de las Americas, even better if you’re staying at the Parque Santiago III hotel complex as it is right on the doorstep. The calm waters mean it’s a great spot for swimming and the huge of amount of palm trees allows you to cool off in the shade during the heat of the day. Dining in Playa de las Americas is a real adventure for the tastebuds. The range of restaurants highlights the continental influences on the resort. Everything from traditional Canarian-style cuisine to homely English food, Tenerife caters for every palate and ensures that you grab a bite to eat with no problem at all. If you’re looking for a real taste of Tenerife then Meson Castellano and Banana Garden serve up delicious Canarian dishes. The former is one of those hidden gems of Playa de las Americas, wedged between a number of busy bars but the food is well worth the effort to find it. Each dish is paired with sumptuous Spanish wine to create a dining experience unlike any other in the resort. Try delicious paella at a great price at Montana and dip into a bit of fresh seafood at Blue Marlin on the beachfront of Puerto Colon. Another favourite for Spanish cuisine is La Rana Loca at the end of Pueblo Torviscas, here you can enjoy the very best tapas options while also taking advantage of the restaurant’s huge cocktail menu. Of course, there are plenty of international restaurants across Playa de las Americas from American steakhouses to Italian bistros. Enjoy some Tex-Mex style cooking at Hacienda Miranda which provides a different take on classic Mexican dishes. The effortlessly cool Bianco Restaurant on the Golden Mile is one of Tenerife’s most sought-after eateries serving the very best Italian food you are likely to find outside of Italy. The House Special Seafood Spaghetti is a local legend packed with scallops, calamari and prawns; it simply has to be tried. You can even enjoy a spot of home comforts at the British-themed Empire Restaurant. Don’t worry, this is not your tacky pie and chips place (although that is on the menu), Empire is a much more refined dining space with succulent steaks, freshly caught fish, a hearty pint of beer and those little touches that remind you off ol’Blighty. When it comes to nightlife, there is nowhere in Tenerife that can rival Playa de las Americas. The proclaimed party capital of the island comes alive as soon as the sun goes down. The neon signs are switched on and the streets of the resorts are filled with tourists and locals looking to enjoy the night’s festivities. The glow of the neon lights will let you know you’re in the Veronicas area of the resort. This mile-long stretch of bars, restaurants, nightclubs, live music venues and shops is the place to get your night started. The streets are packed with holidaymakers every night of the week and with so much choice available, everyone is catered for. Playa de las Americas’ star attraction is the legendary Tramps nightclub. Dubbed ‘The King of Clubs’, it is Tenerife’s best superclub and has regularly been voted the best club outside of Ibiza. Resident DJs and occasional guests blast house music every night of the week with the flagship event happening on Wednesdays. Away from Tramps you can dance the night away in the achingly cool Cuban-themed Havana Chic Lounge Club, watch a cabaret show at Crystals Palace or party in the house of fun that is O’Neill’s. If you’re looking for a raucous night on the tiles, then you have come to the right place. However, if you want something a little more refined then don’t worry as there are plenty of establishments to enjoy a relaxed vibe. Akustito Cocktail sits right on the beach and provides spectacular views of the ocean. It is the perfect place to watch the sunset with a mojito, daiquiri or another of your favourite cocktails. The venue provides the perfect tonic to the hustle and bustle of Veronicas and can either be the starting point or ending point to your evening. Despite its reputation as a tourist hotspot, Playa de las Americas is an excellent destination if you’re looking for a spot of retail therapy. It may be surprising to know but the resort is regarded as an upmarket shopping destination with a host of designer stores that would rival the likes of Barcelona and Paris. Okay, it is not quite the Champs-Élysées or Passeig de Gràcia but Playa de las Americas can certainly mix it with the big boys when it comes to shopping. The best retail area close to the resort is at CC Safari (the Safari Centre), an exclusive mall which is a combination of shops, boutiques and restaurants. Famous brands such as Levi’s, Hugo Boss, Nike, Cartier, Rolex and Armani have outlets here alongside prestigious Spanish brands. Treat yourself to some designer clothing or a special piece of jewellery as a special souvenir of your trip and thanks to the lower taxes in Tenerife, you could be walking away with a surprising bargain. At night, CC Safari is transformed into an entertainment complex with numerous bars and restaurants to choose from. Tenerife’s Hard Rock Cafe sits opposite the main entrance of the shopping centre and can be the perfect place to start your evening. If you’re looking something a little cheaper then the usual souvenir stores are dotted around the resort. Pick up that fridge magnet, comedy t-shirt and, of course, the bucket and spade for the kids when you all head to the beach.